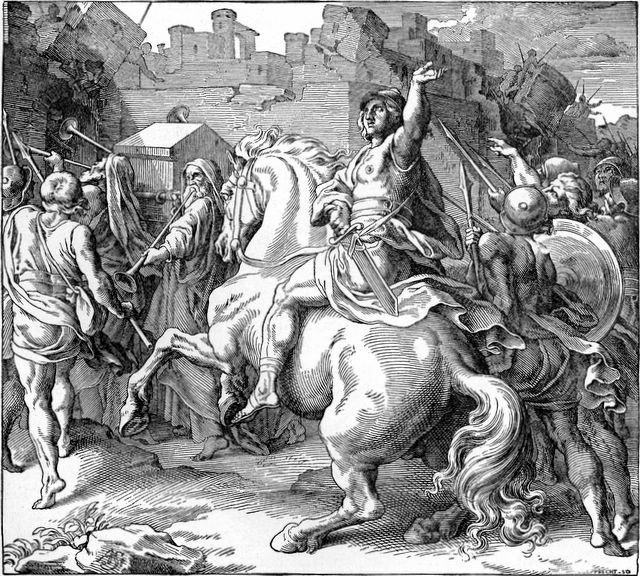 Joshua sent two men to spy on Jericho. They stayed at Rahab's house. The king found out about the spies and sent soldiers to find them. Rahab hid the spies on her roof and helped them to escape by hanging a scarlet (red) rope from her window. They climbed down the rope and returned to Joshua. They promised her that she and her family would be safe when the city was attacked. The country to which the Israelites had come was called Canaan. It was also called the Promised Land because God had promised it years before to their fathers and grandfathers. After they entered the land of Canaan, they began to eat the fruit and grain that was growing there. The manna from heaven stopped coming because now there was food to eat from the land. 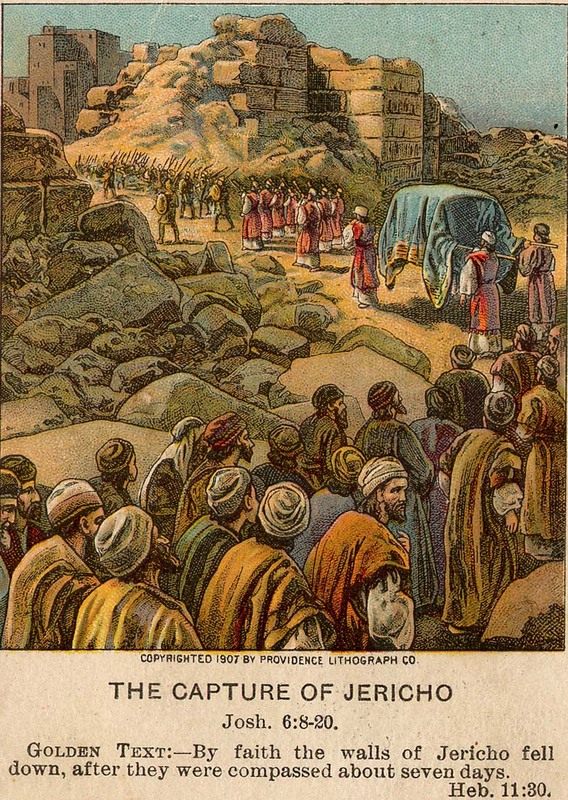 They were camped near the city of Jericho. Jericho had a great wall around it and big, heavy gates. 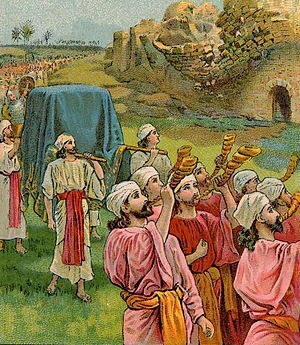 The people of Jericho had heard about the Israelites and were very afraid of them. God gave Joshua a plan for the capture of the city. On six days the soldiers were to march around the city one time each day. Some priests were to march with them, and seven priests were to blow on trumpets made of rams' horns. No one was to speak a word. They followed the plan as God had told them. On the seventh day at God's command, they marched around the city seven times. 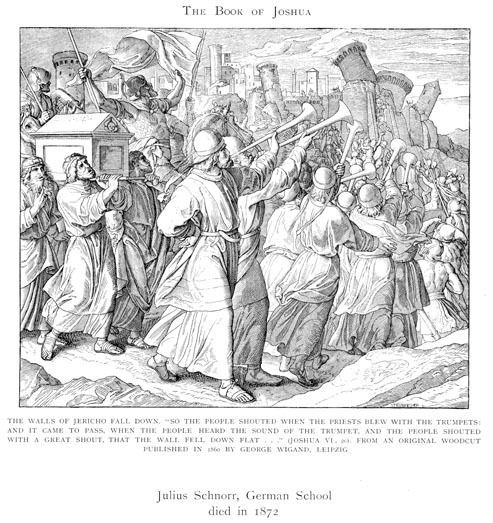 The priests blew on the trumpets and the people gave a great shout. The walls fell down flat and they were able to capture the city. They found the red rope that Rahab had hung from her window, and they saved Rahab and her family. Later Rahab married a man of Israel. They had a son and in later generations, a child was born who would become a king of Israel. His name was David and he was the great-great-grandson of Rahab. Many years after that, another child was born in the same family. His name was ... Jesus. Who do you ask for help when you don't know how to do something? In order to win the victory, the Israelites had to follow God's instructions. What he asked them to do may not have seemed like the sensible thing to do in order to take the city. It may not make sense to you to put others first, but this is what God wants you to do. You may be thinking, "I need to look out for my interests first", but we can learn from the idiom "What goes around, comes around". It means people will treat you just as you treat them. Eventually an evil deed you do to someone else will come back to harm you, and a servant heart will be rewarded. This story about the Exodus can be found in the Bible in Joshua chapter 5:13-15 and chapter 6. 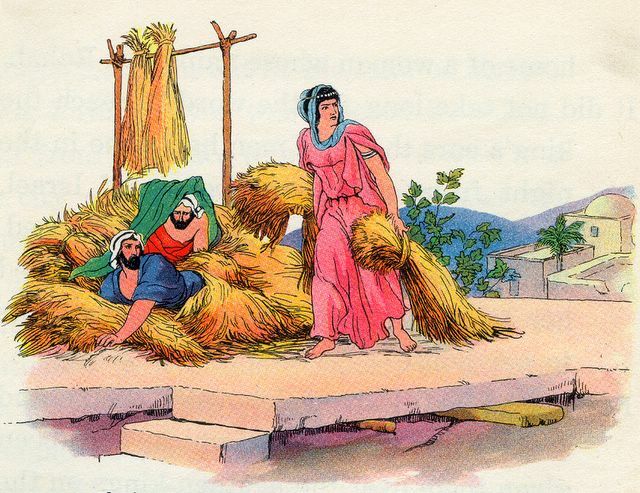 English Bible Activities Select story #58 in the list for activities to accompany this Bible story. Spanish Bible Activities Select story #58 in the list for activities to accompany this Bible story. Press "Go" to search for books about Jericho. I have found all the bible slide shows for the Bible stories most helpful, used them for my bible teaching for kids. Has these slides been removed? How can I access them? This page displayed 170,659 times.